A revolutionary crime prevention system, initially developed to protect church roofs from lead thieves, has made its Royal Highland Show debut this weekend. TecTracer technology – created by York-based Trace-in-Metal – has subsequently been adapted to help in the fight against rural crime, with farmers across the North of England and Southern Scotland using it to not only mark their sheep, but also farm machinery and vehicles from criminals targeting remote areas. Whilst Trace-in-Metal uses ballistics to fire thousands of microdots into metal sheets “marking” them with a unique identifying code, TecTracer uses raddles to ingrain thousands of coded markers into the sheep’s fleece. Once attached to the animal’s coat, it is extremely easy to identify any sheep that has been TecTracer-marked, and which farm it originated from. Together with signs advertising the TecTracer identification process positioned around farm buildings and fields – and combined with an e-alert early warning system linked to the police, farms, abattoirs and auction houses – the system has been dubbed “Operation Bo Beep!”. 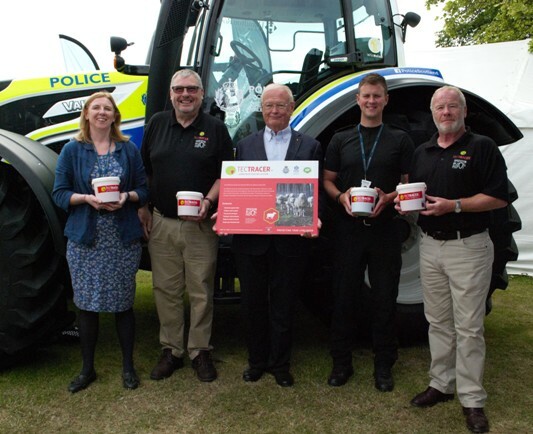 TecTracer director John Minary was invited to showcase the product at the world-famous agricultural show by Police Scotland, where he spoke to farmers and landowners about the security system and its successes. Earlier this year, 14 pregnant ewes were safely returned to the Cumbrian farm they had been stolen from, thanks to the revolutionary marking system. Mr Minary, a former senior police officer who partnered a Swedish ballistics expert to create the system, said: “I’d like to thank Police Scotland for inviting us to debut TecTracer at this year’s Royal Highland Show. “This is one of the country’s most important agricultural and rural shows, and it has given us a golden opportunity to speak to farmers, many of whom have been victims of crime, about TecTracer. “Tectracer is being used by a growing number of farmers and landowners to safe-guard sheep as well machinery and vehicles, in particular LandRover Defenders, from thieves. “Theft of livestock, vehicle and machinery is an ongoing problem across the whole of country, but worryingly so in Yorkshire, Derbyshire and parts the North East including the Borders. Mr Minary added: “I’m delighted that more and more people see TecTracer as an efficient weapon in the fight against crime.